So how does this apply to your computers? It’s in our nature to be reactive. When something is broken we fix it. This applies to many aspects of life such as our health. What if something was in place to prevent computer breakage? Many of us service our cars regularly. Although its not quantifiable we are averting breakage via preventative servicing. Now apply the same concept to computers and you can reduce your yearly spend on reactive computer maintenance, or as we call it in the industry “break/fix”. 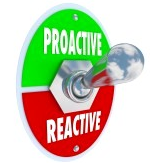 If you’d like to learn more about moving from a reactive IT approach to a pro-active strategy then contact Chicken Soup for a consultation and assessment of your needs. A small piece of software installed on your PC or Mac monitors the health of your computer daily. Should a particular part of the computer fail an email is sent to Chicken Soup to bring the issue to our attention. Your computer is kept secure by applying the constant stream of security patches/updates required by Apple and Microsoft. Managed services will automate that procedure for you. Critical patches are applied automatically. Even updates to other software like Adobe products are taken care of. Strong reliable antivirus is an absolute necessity. Antivirus and Antimalware products are constantly evolving based on the virus climate. Best of breed antivirus is recommended to clients with a focus of cloud based reporting so any issue encoutered in your infrastruture is quickly reported back to Chicken Soup Central. Cloud backup will ensure your critical files are stored in a secured encrypted cloud-based location. We recommend cloud based backup as an addition to any on-site backup system you are currently using. With just a few clicks, we can quickly enable a backup on individual servers and workstations – or on all servers and workstations. Multiple different backup schedules may be set up to suit your requirements.